Making food a daily ritual….with a French touch! Food is everywhere in France, as you might expect. It’s a favorite topic of conversation, and even the subject of hit TV shows; the French version of ‘American Idol’ features would-be chefs in high-drama cooking show-downs. This is prime-time TV! And many people in France are glued to their screens as the final episodes unfold. But food — and the joy of savoring good food — also pops up in lots of little, unexpected ways in everyday life. For example, look at this piece of paper towel. I bought it at our local supermarket (not at a fancy speciality shop). 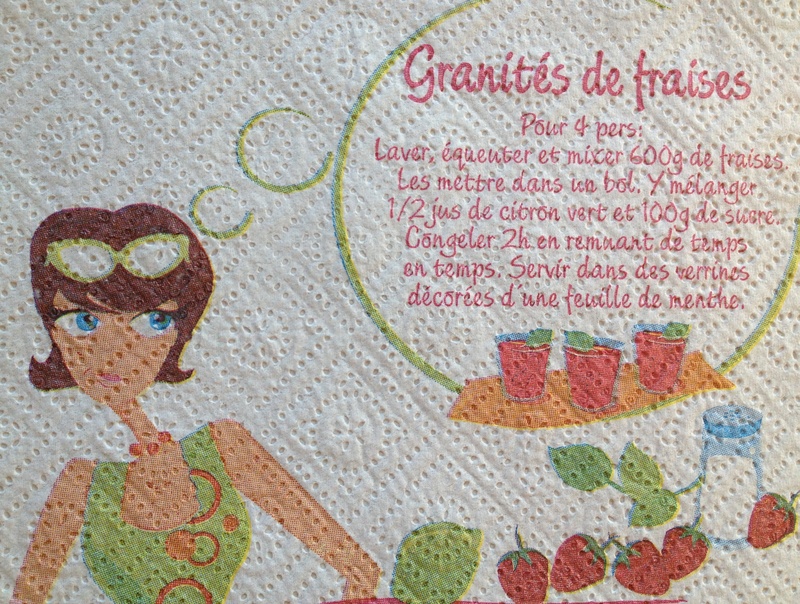 Each piece on the roll has a different recipe (this one is for a wonderful summer dessert called Granité aux Fraises). The recipes rotate seasonally (we bought this roll earlier in the summer). Even the most mundane object can be transformed by a little lighthearted nod to the pleasures of life. Savoir-vivre, as they say. ps In case you were wondering, yes, it is only coquettish women shown on the paper towel rolls. Gender equity in the kitchen is not a strong point for the French–at least not yet. However, that’s an entirely different debate–about which I will be blogging next week! Cool! Can’t wait to read about the gender equity in the kitchen! This is great. You also have “Un dîner presque parfait” that I recommend my readers to watch to see how a French dinner goes. How we see food. And yet, even if food at the center of our lives, we mostly see it a social moment. Not “just feeding”. Thanks for your article Karen!